The Mendocino Folklore Camp - International "Camp Band"
From the early years, Mendocino Folklore Camp has had a unique history with International music and dance, and many wonderful musicians, dancers, singers and teachers have graced our dance hall, lounge, trails, grove, fire pit and meadow with their considerable talents over our 54 year history. There is literally no part of camp that has not known the sound of voices singing, feet dancing, musicians playing and teachers instructing. Many of those talented people have also been part of our Folklore Camp Band. Talented musicians who play nightly for our evening dance program. They also play for some of our themed "happy-hour folklore celebration" parties, and in our late night Kafana. We have been lucky to have a wide variety of talented, dedicated musicians, many of whom come back year after year and become part of our Folklore Family. music directors for our camp band over our 50 year history, each bringing their own brand of expertise and interest; Barbara McOwen, Jananette Duncan, Becky Ashenden, and more recently Miamon Miller, Bill Cope and Linnea Mandell. PLUS our extend family of long standing musicians that have graced our dance hall with their beautiful music; Paul Brown, Chuck Corman, Paul Morrissett, Michele Simon, Erik Hoffman, Jeff O'Connor, Mark Levy, Lorretta Kelley, with guest teacher/musicians Ruth Hunter & Christos Govetas, Tzvetanka & Ivan Varimezova, Michael Alpert, Polly Tapia Ferber, Michael Ginsburg, Souhail Kasper, Ross Campbell, Mary Sherhart, Michael Lawson, John Morovich, Mark Forry, Alan Keith, Brenna MacCrimmon, Ivanka Paunova, Eva Salina, and band singers; Bev Mann, Wendy Zukas, Nancy Lawson, Susie Burke, Janice O'Connor, Sean Burke, Daniel Tuutau, Suzannah Parks, . And on rare occasion, whole bands that have played for us; Chubritza from Arcata, CA and Harmonia from Cleveland, OH, and Beata Bermuda from Sweden! All three bringing a wide array of International dance music. on world music, and the very specific skills of being able to play a wide variety of International folk dance music each night for dancing. Bill is a long standing member of our Folklore Camp teaching staff, band member and part of our beloved Folklore family. He is a master at teaching Beg./Int. Tambura, and many in the Balkan community have learned their first chords on this instrument from him. At Folklore camp this summer, Bill will be teaching a daily BEG/INT. TAMBURA (Macedonian & Bulgarian) class. All levels are welcome.. but building on the last few years worth of learning, this class in 2016 will be geared more toward an intermediate level. If you want to take his class and do not have an instrument, please indicate on your 2nd flier form that you'd like to borrow one and we'll do what we can to make that happen. Also any 5 string instrument will work as well; he's had Mandolins & Ukuleles in this class as well. 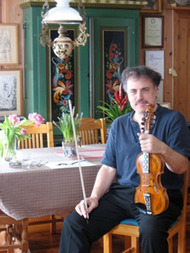 Contact Bill at: http://balkantunes.org/ for any questions in regard to instruments that might be acceptable. Linnea's grew up listening to international folk dance music as the child of folk dancing parents, and has many happy memories of attending folk dance camps every summer from the time she was an infant carried in the dance line. As part of her lifelong love of dance, she spent many years performing in international dance and music ensembles including the Northcountry Folk Ensemble, the Humboldt Ballet Folkórico, and Arcata Salsa Rueda. Like his sister Linnea, Douglas grew up listening and dancing to international folk dance music. His musical education also began early, including the same five-part car singing, plus piano lessons in Kindergarten. He then went on to teach himself guitar by watching Educational Television, and took up the trumpet a few years later. It was probably the time he spent sitting behind the speaker while his parents taught folk dancing that infused in him a love of the bass, which he then taught himself to play during high school when the bass player stopped showing up for jazz band rehearsals. Since then, Douglas has continued to be active in a wide variety of musical endeavors ranging from singing opera to playing and singing in a rock band. 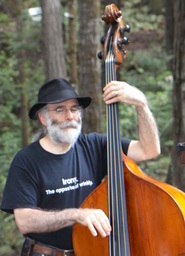 Recently he has played bass for the Tamburitza and Kolo Festival bands in San Francisco, and last year had the pleasure of joining the Folklore Camp Band for the final activities. 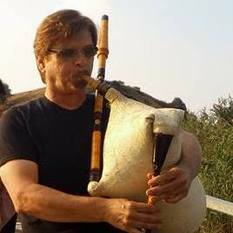 in California where Steve began studying the Greek family of bouzoukia; he plays the old-style trichordo, along with the tzouras and baglama. currently plays guitar in Seattle with 2 groups. Viennese Blend, a lovely trio performing music one might hear in a cafe in Vienna. 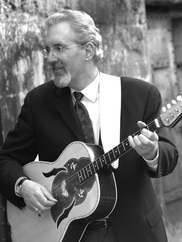 He also formed a duo that performs country and eastern music with renowned Northwest musician, Stanley Greenthal. Michele is a gifted and generous teacher, and a talented collaborator. She has been involved with Balkan folk music for most of her lifetime as a dancer, singer, drummer and teacher and has performed with many groups over the years, including KITKA Women's Vocal Ensemble, and the Balkan bands Anoush, Orkestar Sali and Zabava! Izvorno. She is also a founding and current member of the popular Brass Menažeri Balkan Brass Band in which she drums and sings. She is also the singer and drummer with the Helladelics, a four-piece Greek roots band. 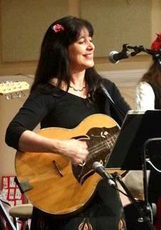 She has studied with numerous native-born musicians, and has appeared on recordings and stages across America and in Bulgaria, as well as on Bulgarian National TV. 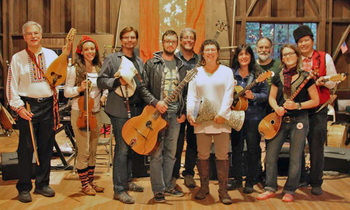 Michele teaches private students and workshops throughout the West, including the popular "Balkan Vocal Technique" class at our Mendocino workshop. As a singing teacher, Michele's specialty is integrating Balkan vocal styles with American voices, focusing on placement, ornaments, and pronunciation using innovative imagery and exercises. As a drummer, Michele plays the big drum known variously as tupan/daouli/davul, as well as doumbek and frame drum. She has played her way through a multitude of Balkan dance rhythms, including odd-metered time signatures (5/8, 7/8, 9/8, 11/8), as well as rhythms that stretch out of time. 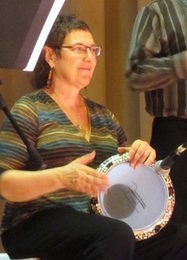 Her background as a dancer gives her a special understanding of the rhythms; her teaching of percussion includes both technique and the "feel" of the rhythm. Michele is a long standing member of our Folklore Camp teaching staff, band member and part of our beloved Folklore family. ..along with guest musicians; Michael Alpert, Erik Hoffman, Craig Kurumada, John Morovich.. & friends!